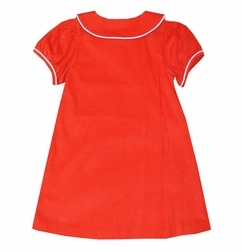 We just love this pretty red small wale corduroy dress by Three Sisters. It is embellished with a Peter Pan collar and scalloped front faux closure piped in white with white covered buttons. Perfect for Christmas pictures! 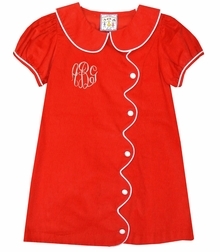 Caroline Bradlee Designs" "Carouselwear Collection" "Chapin Heirloom Company " "Claire & Charlie" "Claver & Luigi" "Cotton Kids" "Cukees" "Delaney" "Dondolo" "E Land" "Feltman Brothers" "Flap Happy" "Frumpy Rumps" "Funtasia Too & Maggie Breen" "Haute Baby" "Highland Porch" "Hug Me First" "Jack & Teddy" "L'Amour Shoes" "LaJenns" "Le' Za Me" "Little Handprint" "Lullaby Set" "Maggie & Me" "Maria Elena " "Mulberry Street" "Paty, Inc." "Petit Ami" "Peppermint Pony" "Posh Pickle" "Pure Elegance" "Remember Nguyen" "Rosalina" "Royal Child" "Sarah Louise" "Sage & Lilly" "Silly Goose" "Sugarbug's Closet" "Sweet Dreams" "Three Sisters" "Vive La Fete" "True" "Turtles by Rubani" "Will'Beth" "Zuccini"
If there is any way we can improve your shopping experience, please contact us and let us know.